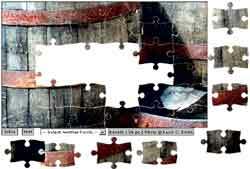 Drag-and-drop jigsaw puzzles. Several to choose from, ranging from 16 to 80 pieces. Be sure to maximize your browser and have a resolution of at least 1024x768 to make room for all the puzzle pieces. Thanks to Kevin at centricle for the use of his photos.